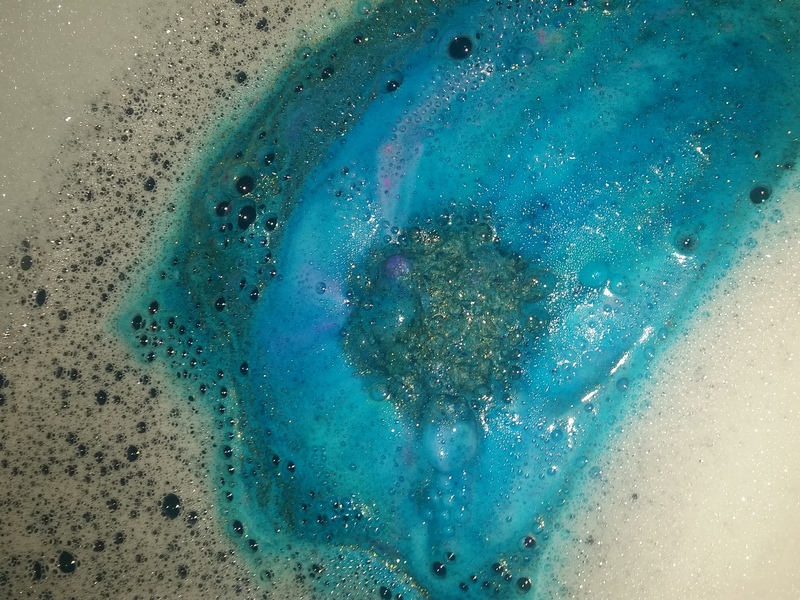 I had very few expectations of Lush’s Intergalactic bath bomb when I first seen it. From the outside it just looked like an uninspiring blue sphere that had the odd speck of glitter on it, perhaps from being rubbed up against another product, and the smell was barely present at all. The thoughts of “here we go again, another product at a rip off price that does nothing other than turn the water a funny shade”, c’mon we all have experienced at least one of those bath products along our journey of discovery. But then it went in the water and my entire thoughts on it were quickly proven wrong. 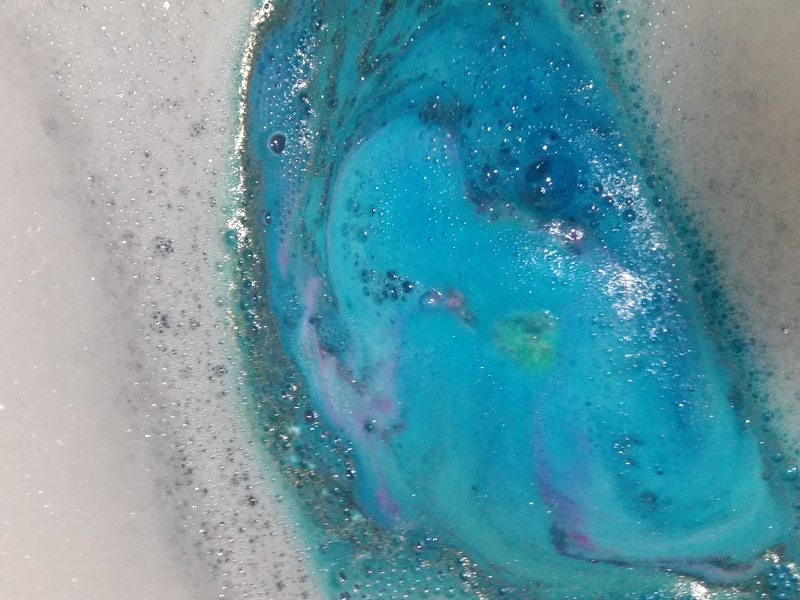 The bath bomb fizzed at a reasonably quick rate but enough for the colour layers to seep out individually and to attach onto the bubbles to make for an incredibly pretty pattern and from that moment on I was mesmerised. The blue came through in all different shades with the odd hint of pink and purple coming through as well to help give it a real depth of character, look like a scene you might imagine when thinking of the night sky and the galactic world outside of our own window and give that calming effect as it gently rocked around in the water. With the gold glitter getting dispersed throughout the blue hues as well it really added to the magical effect and allowed for the ability to dream of a peaceful soothing place with nothing to break up the view or thought process for miles around. Whilst the pattern was just amongst some bubbles at arms reach from me it really felt like I was seeing miles into this little patch of colourful heaven. 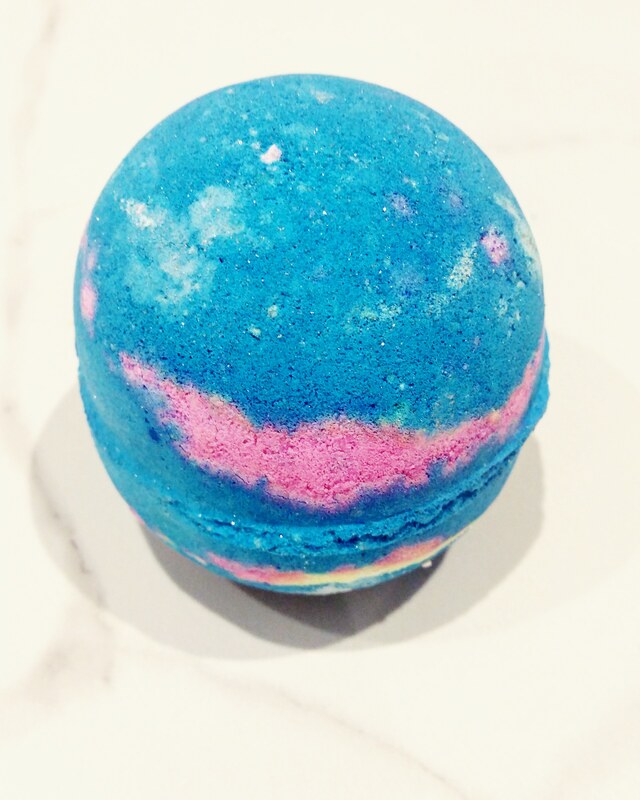 Before I had even properly breathed in I was in a very happy and relaxed place with this bath bomb, something that has proven not to be a one off with Intergalactic. The scent of the product is also incredibly soothing, which might be unexpected given the presence of peppermint oil a usually invigorating scent, and that really helped to add to the relaxed mentality before even stepping into the bath. Out of all the incredible oils making this product up, it is the cedarwood oil that sticks out to me the most over the longevity of the bath. This is a scent that can be love or hate for some people but it goes down fairly well in my world and gives a comforting and further calming feeling to me and along with the delightfully pretty sight on top of the water and throughout it really helps to clear the mind and allow a few moments of mental peace. 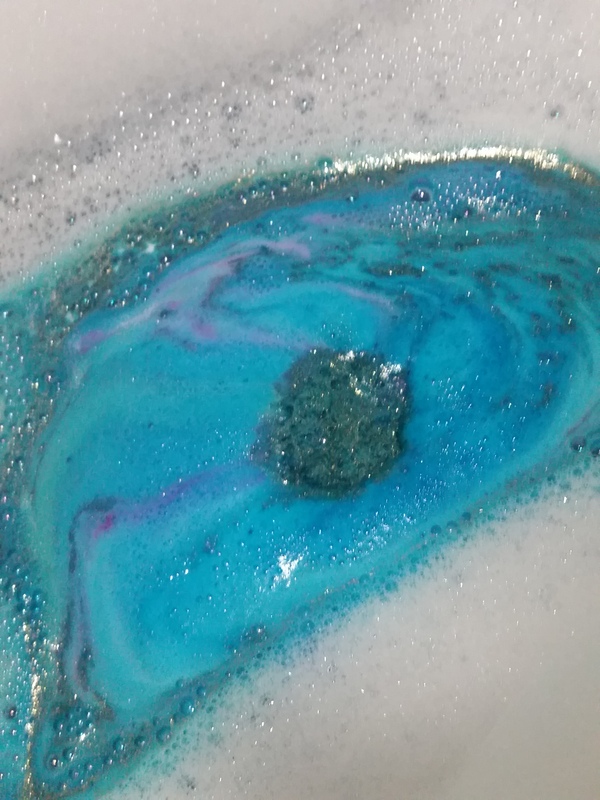 It has been a while since I have really been impressed by a Lush bath bomb and not been able to raise any complaints about what it does, how it smells or how it fizzes away but Intergalactic really hits the spot for me and certainly makes the £4.50 price tag worthwhile as a very occasionally pick-me-up treat. This is certainly not a ride-or-die bath product for me but it is certainly up there as one of the more enjoyable ones I have used recently and I can strongly recommend it based on my experiences of it improving my general mood, it giving a real little show in the bath and just being a really cool blue ball of joy. 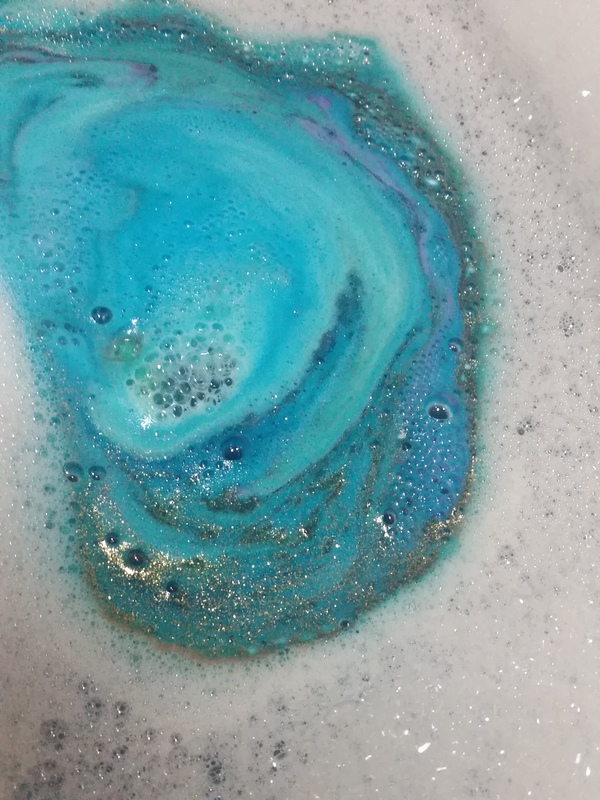 Intergalactic and The Comforter are on my list of things that I really need to repurchase the next time I go along to Lush, what are the things that you get the most joy from when walking into one of their overwhelmingly wonderfully pongy stores? 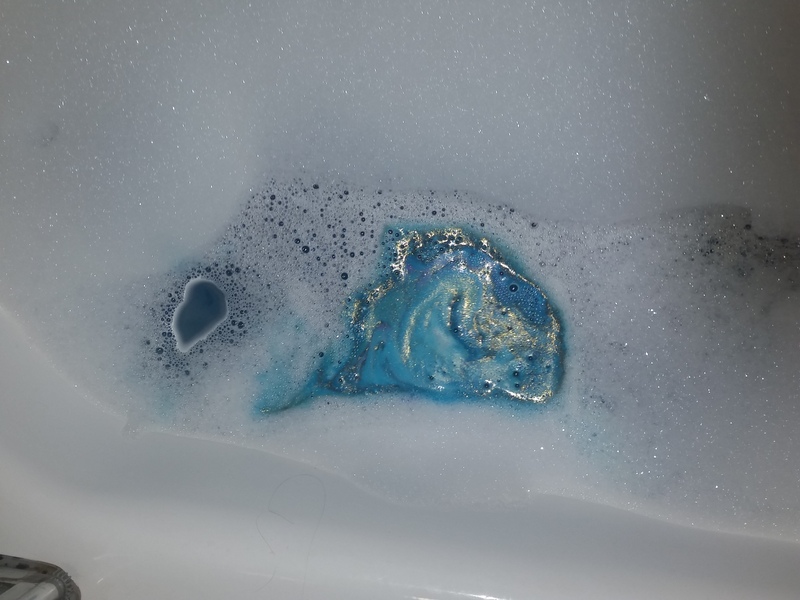 This entry was posted in Bath/Shower, Beauty and tagged bath, bath bomb, bblog, bblogger, bbloggers, Beauty, beauty blog, beauty blogger, beauty bloggers, beauty product, beauty review, blogmas, Blogmas 2017, blue, bubble bath, bubbles, glitter, glittery, gold, gold glitter, intergalactic, intergalactic bath bomb, lblog, lblogger, lbloggers, life, Lifestyle, lifestyle blog, lifestyle blogger, lifestyle bloggers, lush, lush cosmetics, selfcare, Skincare, vegan, water. Bookmark the permalink.